It struck me as I was trampling along the Domino Trail yesterday that our budgeteers are actually making communism look attractive. But the fertile ideas spreading here had more to do with hiking business than political persuasion. Yes, I am pleased to announce that friendies who are occasional readers of this blog have come under the sphere of influence. They are becoming walkers. Not in a Walking Dead kinda way…though it is true that they did appear dead tired after our 13km outing, which they courageously tackled hung-over. Once a month, Anne and Alana are joining me for a Sunday walk. This time it was Anne’s turn to nominate the destination. I admit I was at first dubious (or maybe righteous?) about a walk to a pub. Does it count as an authentic outdoor experience? In the case of the Domino Trail the only answer is “bloody oath”. 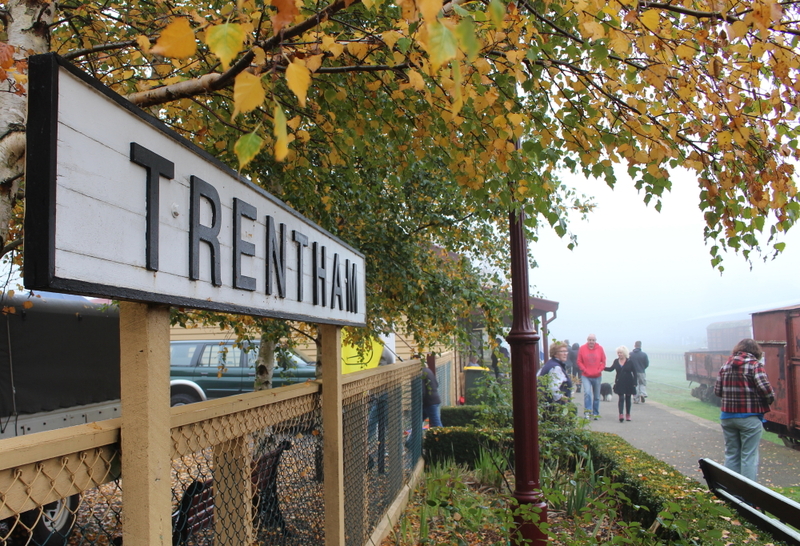 We left behind decrepit trains as we departed from the former Trentham station, shrouded in eerie fog. Our intended journey was along the old rail trail to Lyonville, part of the original railway from Daylesford to Carlsruhe. Now it is basically a flat and dead straight 6km (one-way) compacted earth and gravel track though the Wombat forest to the centre of the universe. There are two optional loop tracks to take along the way, which have lighter coloured owl markers than the dark green ones positioned along the main track. We exited onto one of these circuits and then went off the rails. I must have been too focussed taking pics to notice when we needed to loop back to the main track. Instead we found ourselves scrambling along a fire-track (possibly Blyth Road) then uncertainly edging our heads out of the bush at the opposite end of Lyonville. 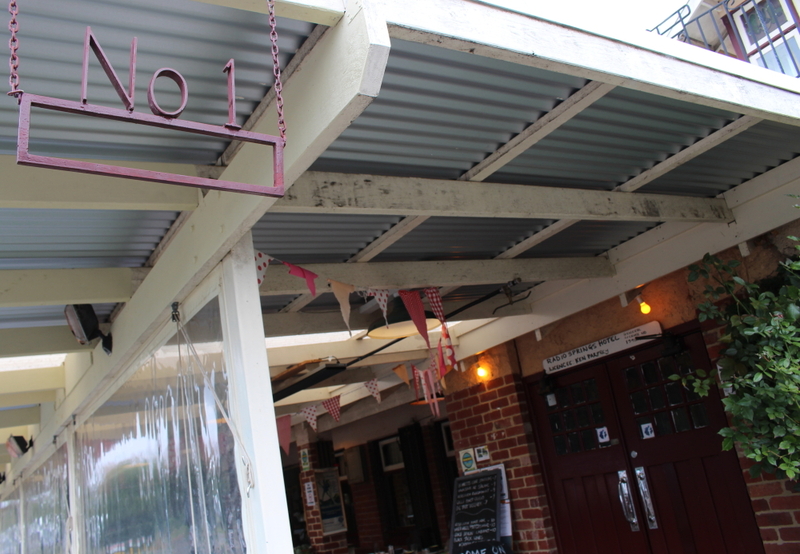 Luckily, the township was vaguely familiar to me so it was easy enough to find our lunching place. The first time friends took me to the Radio Springs Hotel it felt like being transported into another enchanting time. There is something homely and yet also other-wordly about this venue that magically pops up to greet you at the end of the trail (well, if you don’t end up deviating like we did). The food was hearty and good. Anne delved into the mushroom pasta but there was an even more spectacular fungus frenzy going on outside. We couldn’t tell the hallucinogens from the fairy houses. But my companions were onto it anyway, finding fungus with ferocity akin to the Hobart airport sniffer dog who once nabbed my mate with her quarantine breaking banana. Signs marking the kilometres back to Trentham help make this a good family walk where you can respond to those ‘Are we there yet?” questions with some semblance of credibility. Because we’d missed two-thirds of the trail proper, the return journey held novelty value rather than just being a repeat. 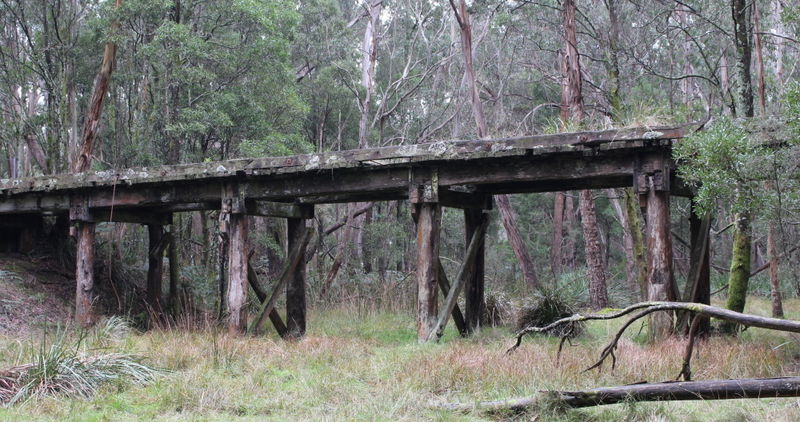 The old rail bridge and information signage were interesting points at which to pause and observe. It wasn’t countries that had fallen like dominoes here – it was the trees. 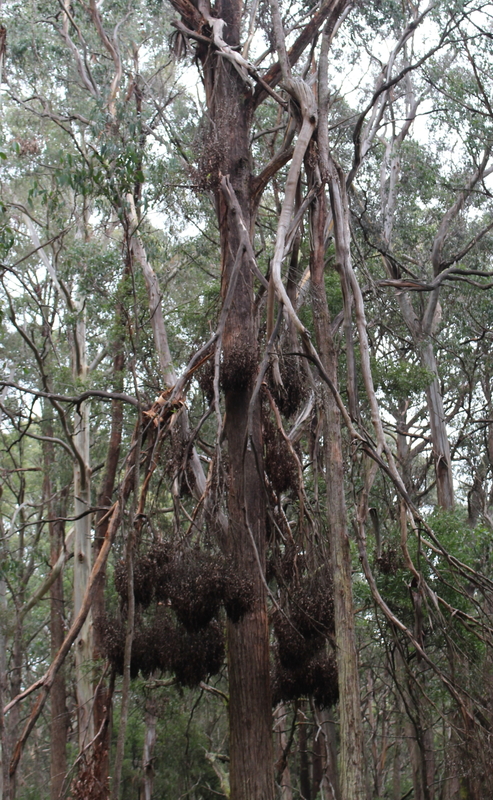 A royal commission into logging in the 1890s halted activity for a time before the demands of the 20th century put the area under pressure again. 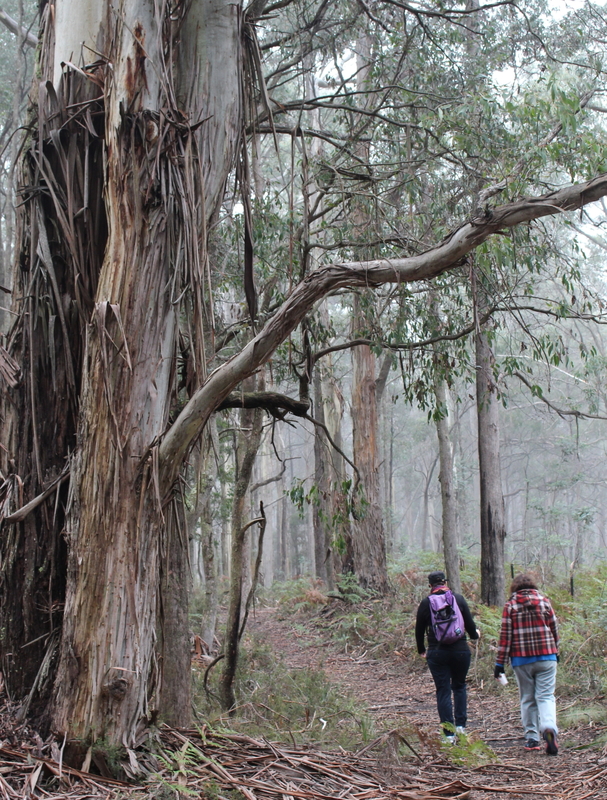 The Wombat State Forest is now community managed sustainable forest. I doubt that’s a euphemism for communism – more likely a weasel words justification to log. I really don’t know enough about the context, other than a good outing discovering the biodiversity of this spot leads me to hope that logging history doesn’t repeat itself. 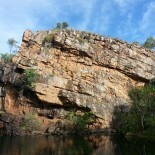 This entry was posted on 26/05/2014 by njd1insulin in Uncategorized and tagged budget, communism, diabetic, domino theory, Domino Trail, fog, fungus, hike, logging, lyonville, Radio Springs Hotel, rail trail, Trentham, Type 1, walk, Wombat State Forest.